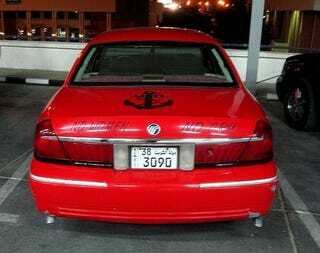 When you're rollin' Grand Marquis style in Kuwait, laughing at the suckas in their effete Benzes, you need to let the world know how you feel about… well, we can't quite figure that out. Check this Mercury Grand Marquis. It's in a beautiful orange-red with an exquisite quote on the back of it. The awesome anchor logo is the key to its beauty.